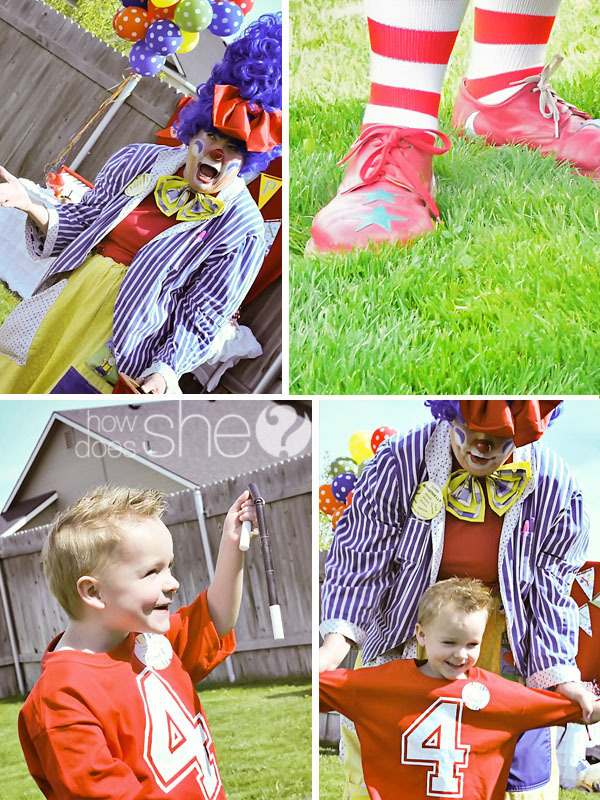 Clown theme party: Noah is 4! 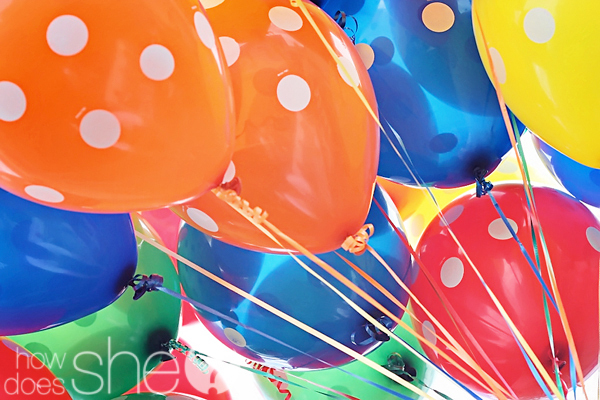 Some people just have such a knack at throwing parties, don’t they? Shelley from How Does She is definitely one of those people! 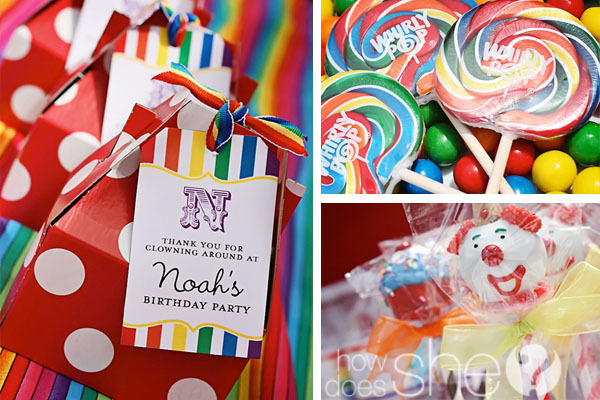 She’s already set the standard for sweet shoppe and golf theme parties, and she’s hit it out of the park with yet again – this time, with a clown party for her sweet boy, Noah. 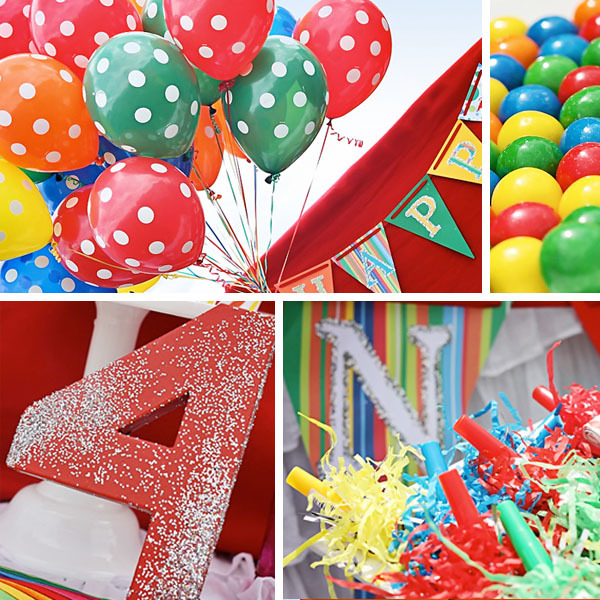 Rainbow theme decor is just perfect for a clown party! 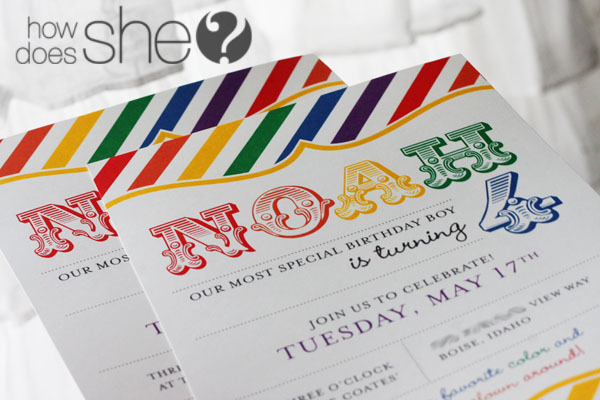 Customizing the rainbow theme invitations for a clown party was simple – Shelley simply added “come clown around!” to her party details. 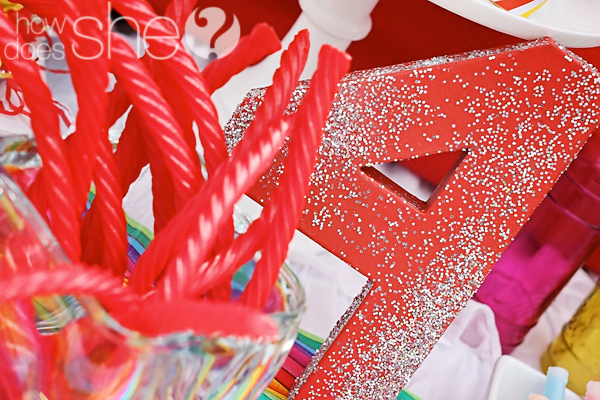 Nancy from A to Zebra Celebrations created the sparkly #4, along with the rainbow banner and table runner. 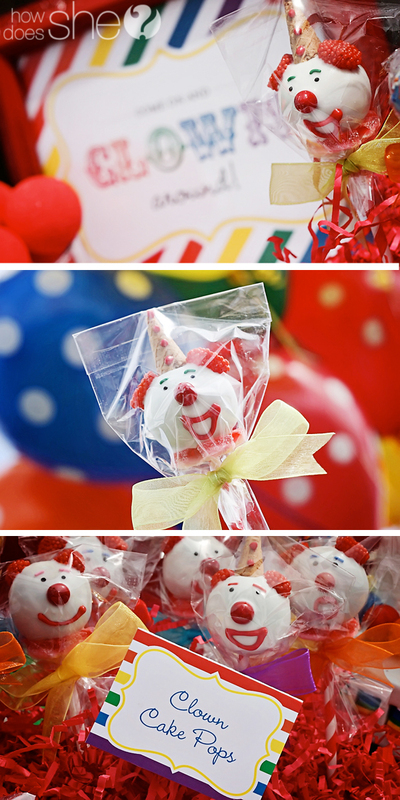 Adorable clown cake pops were created byMom’s Killer Cakes, and each item on the candy buffet was labeled with my rainbow buffet cards. 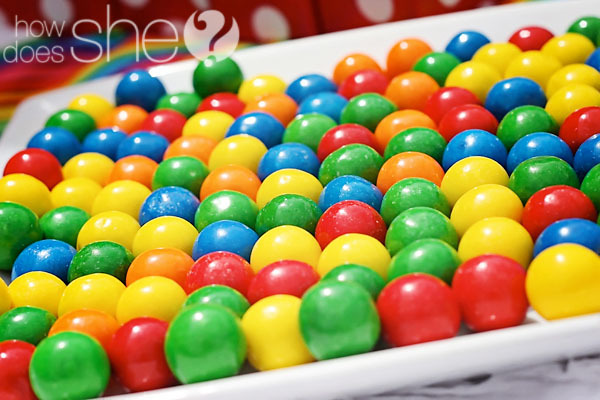 I love the gumballs around the base of Noah’s rainbow cake! 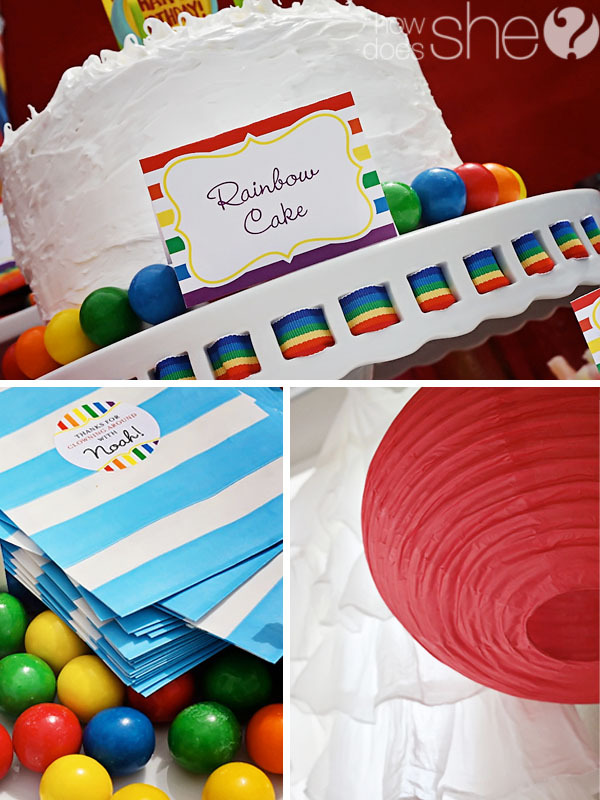 (Cake decorating so simple even I could do it.) 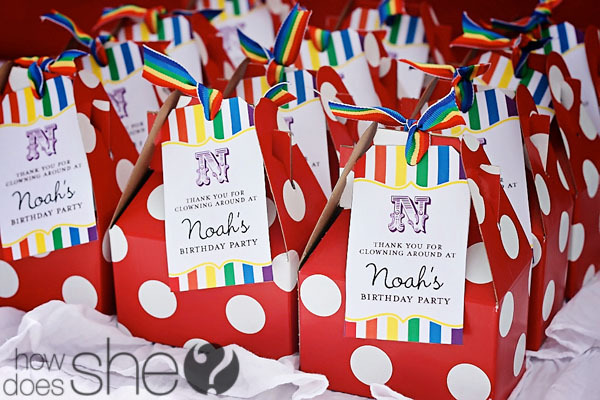 : ) For favors, guests made their own goody bags of candy. 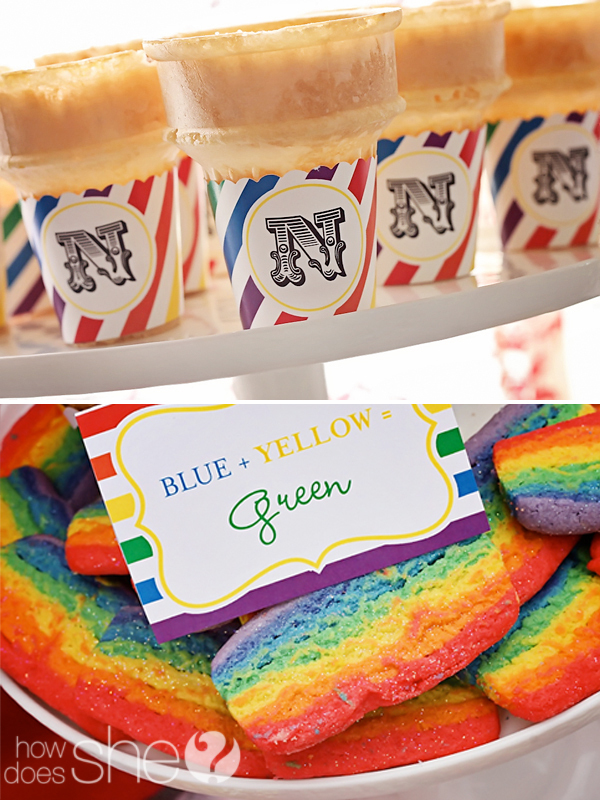 Rainbow stickers were used as a nice thank-you note on the treat bags. 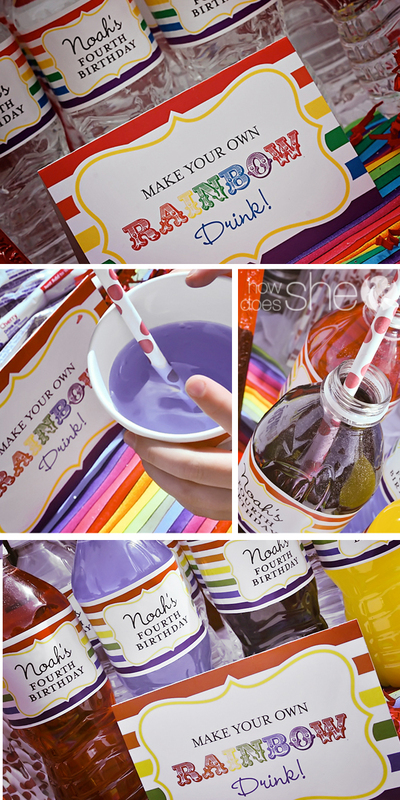 Shelley took a little inspiration from Emma’s Rainbow Party and set up a “make your own rainbow drink” bar, including water bottles with custom labels. SO much fun for the kids! 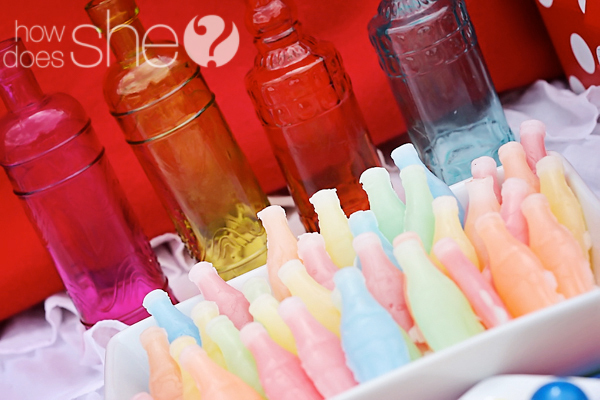 This is really cool – I would have never thought of this! 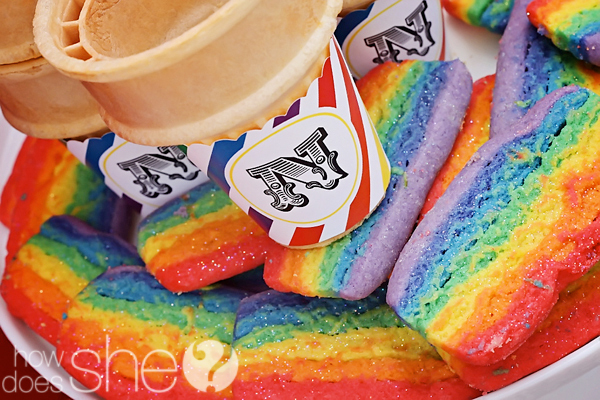 DIY printable cupcake wrappers were used as wrappers for ice cream cones! So super clever! 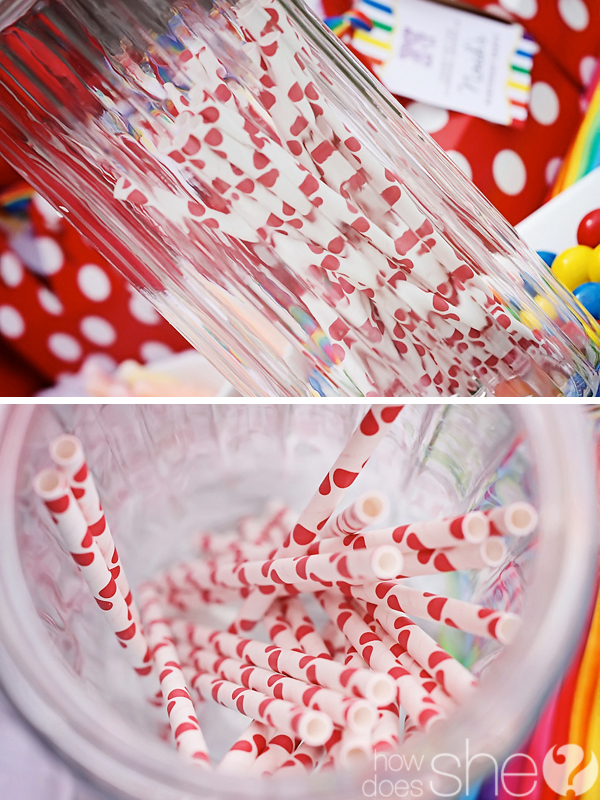 The polka dot favor boxes, straws, glass bottles, balloons, party lanterns, and colored gumballs were all from Polka Dot Market. The printable favor tags are from Chickabug. 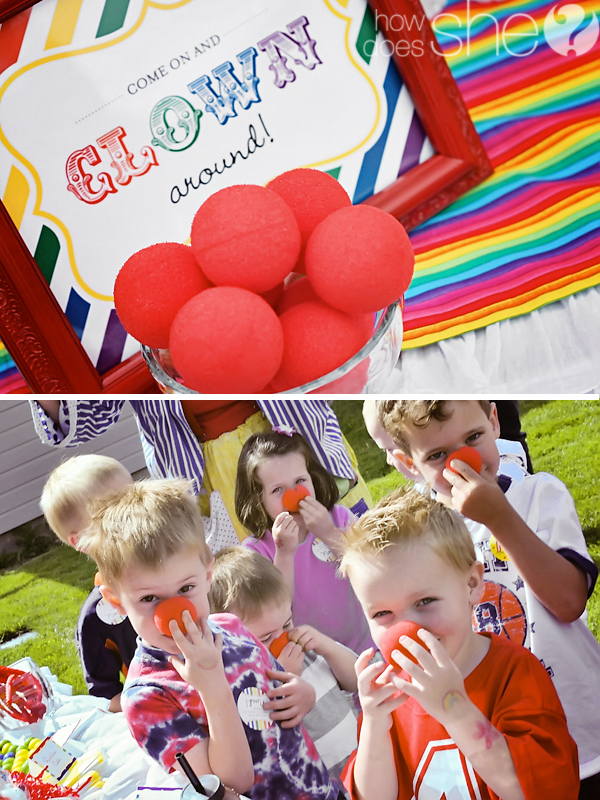 And of course, at a clown theme party there must be a CLOWN! The man of the day, Noah! 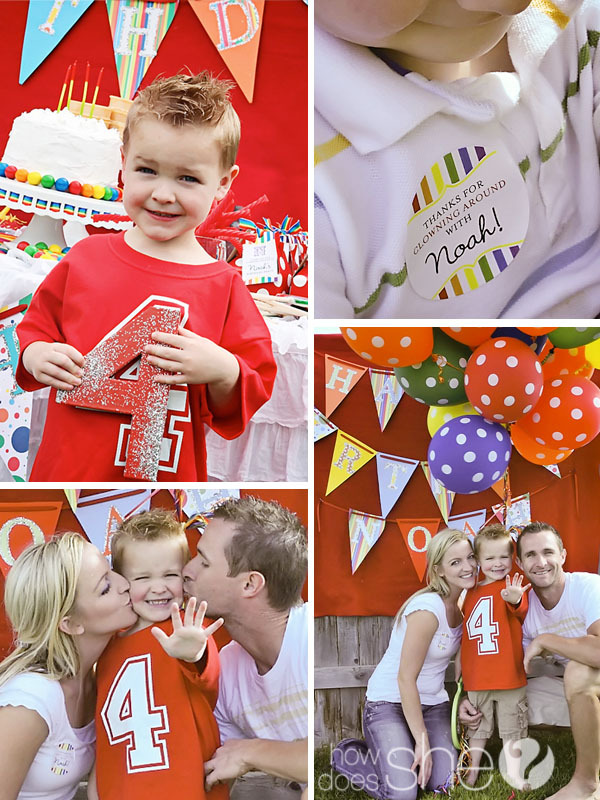 His cute number 4 t-shirt came from 2 Sweet Tees. The sticker he’s wearing is from Chickabug. I just love this little guy. : ) Thank you so much, Shelley! 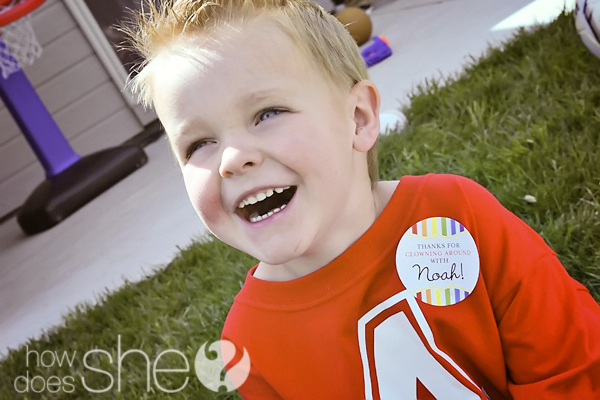 Happy 4th birthday, Noah! 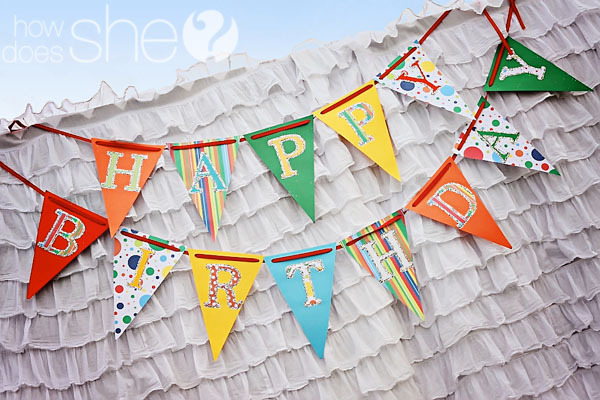 This party has also been featured on How Does She.